Home / News / Should you go legit in roller derby? Should you go legit in roller derby? Derby names are part of our sport, right? They can be really clever, creative and just damn cool. They are part of our history, our culture and give skaters who appreciate their privacy an alter ego to channel. Me sporting a lovely boutfit and full make up. But what about the future of our sport? Is it our derby names and boutfits that stop us moving in to the mainstream or is there more going on? There are so many complex issues and so many ideas about where the sport should be going that I wouldn’t dream of trying to pull it all apart and analyse in one blog post. But it is worth saying that in modern roller derby, a lot of people have given their time, their money and their effort to get roller derby to where it is that understandably, they want to enjoy the legitimacy that comes with sponsorship and seeing it on TV in local and national sports news. Unless your derby name is rude or offensive, I really can’t see how derby names have a negative impact on the sport’s legitimacy. My answer is usually, come and see our next bout. Back to the original question… should you go legit? If it’s good enough for Kristen Lee and Stefanie Mainey then that’s good enough for me! In all seriousness though, I don’t think the pressure is as strong any more to choose a name because being a derby girl is more about athleticism, hard work and immersing yourself in a team of wonderful people who support each other. Why am I going legit? Truthfully, I never felt any affection for my derby name (Kill’Her Instinct) but everyone else had a derby name so naturally, I wanted one too. On the other hand, my number (#F3C0) amuses me and I don’t want to lose it. I also wanted to use my new married name for more than banking and taking my bunny to the vet. Are you thinking of going legit? What is stopping you? 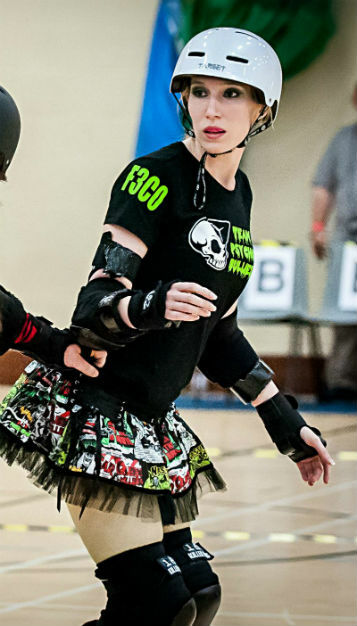 Why is your derby identity important to you? Tell us what you think and comment below. I gave this a little read a while back, when considering my league transfer and whether my derby name would follow me… There was a name similar to my ‘derby name’ in my league, and there was already a number 13, which isn’t really surprisingly as I guess I’m not the only ex-goth to have chosen that as my favourite number. I’ve also gone ‘legit’ and similarly didn’t have a particular affinity with my old name ‘Ruby Bruiseday’, which I’d outgrown in reality, anyway. It developed from my old league’s ‘fresh meat’ practice (Tuesdays) out of which I always got lots of bruises. I still have a pretty red glittery sticker on my lifer S-one helmet… But I guess, like you, my derby-name felt redundant for me. It’s a personal choice and I still enjoy lots of derby-names I encounter… although some make you cringe.